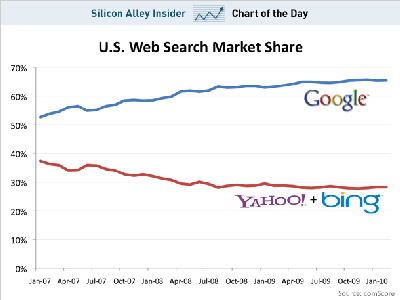 Even after Microsoft links its Bing search engine up with Yahoo later this year, it still has a long way to go to catch Google. And that’s why Bing will probably never become a highly profitable business for Microsoft. Our Henry Blodget reports that Microsoft is building Bing with a cost structure designed to handle 40% to 50% of the U.S. search market — primarily server and bandwidth expenses. But when it takes over Yahoo’s search traffic later this year, Bing will only represent about 30% of the U.S. market, according to comScore. Worse, Bing’s “owned and operated” traffic — which generates far more revenue per search than “partner” searches on sites like Yahoo — will be only about 12% of the market. The good news for Microsoft is that Bing has been growing its share of the search market since launching almost a year ago. The bad news is that it’s only really taking share from Yahoo. To become profitable, Bing will have to take significant market share from Google in the coming years. And we just don’t see that happening. 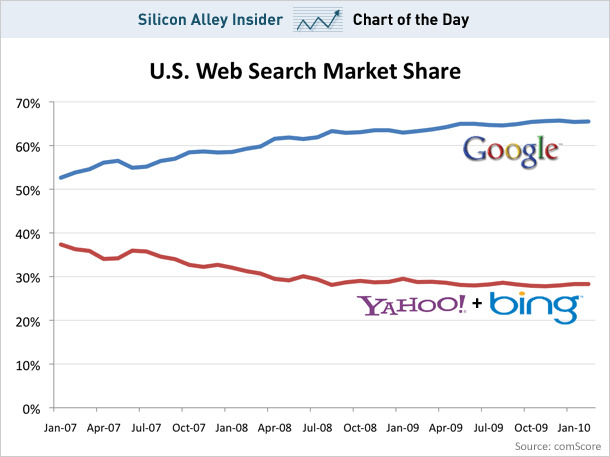 bing chart of the day google online sai-us search yahoo!